The most powerful figure of the Deadball Era, Ban Johnson's rise to prominence in the national pastime was as improbable as it was meteoric. Relying neither on athletic renown (his amateur catching career was abruptly cut short by a thumb injury) nor inherited wealth (he dropped out of law school to become a journalist), the talented Johnson maneuvered his way into becoming president of the Western League in 1893, then skillfully transformed the fledgling circuit into one of the most formidable minor leagues of the late nineteenth century. At the turn of the twentieth century, Johnson renamed the Western League the American League, declared major league status, and then succeeded in challenging the one-league supremacy of the National League. Johnson's triumph marked a turning point in baseball history, cementing the modern two-league system and setting the stage for the unparalleled financial successes of the coming years. Byron Bancroft Johnson was born in Norwalk, Ohio, on January 5, 1864, the fifth of six children of Alexander Byron and Eunice C. Fox Johnson. Shortly after Ban's birth, the Johnsons moved to Avondale, Ohio--then a Cincinnati suburb, though today it is part of the city--where A.B. Johnson served as a prominent school administrator. The elder Johnson, who hoped his son would continue the family lineage of educators and ministers, was irritated when Ban ignored his studies to run off to play baseball as a youth. After graduating from preparatory school, Ban showed a lack of focus in his studies, bouncing from Oberlin College to Marietta College to the University of Cincinnati Law School, where he would remain for less than two years. At Marietta, the big, sturdy Johnson gained a reputation as a fearless catcher on the school team, manning his position without a glove, mask, or chest protector. Not surprisingly, a thumb injury ended his baseball career. At the time of the injury, his experience consisted of a handful of games with the semipro Ironton, Ohio team while on vacation from school. When Johnson dropped out of law school midway through his sophomore year in 1886 to take a job as sportswriter at the Cincinnati Commercial Gazette at $25 a week, his father hit the roof. The paper's legendary editor, Murat Halstead, was finally able to convince Ban's father that journalism was an honorable profession. When sports editor O. P. Caylor left the Cincinnati paper to take a similar position in New York, Halstead named Johnson to the job. Johnson soon earned a reputation for his knowledge of sports and willingness to speak his mind. From the beginning, he didn't back down from volatile topics of the day. For example, he was a champion of the Players League in 1890, which alienated, among others, Indianapolis Hoosiers owner John Brush. However, his strong opinions won him the friendship of others, such as star first baseman Charles Comiskey, who had joined the Players League. When the Players League folded after 1890 and the American Association dissolved into the National League the following year, a new circuit, the Western League was created in 1892. The progressive new league was the brainchild of Jimmy Williams, a Columbus, Ohio, attorney. Williams was one of the founding fathers of the American Association and the minor league International Association and was named president-secretary-treasurer of the new league. The circuit got off to a shaky financial start, however, and Williams was forced to close down the league in July, 1892. In the fall of 1893, members of the disbanded league sought to rekindle the circuit, but Williams begged off, claiming he could no longer take charge of keeping the league afloat financially. Comiskey, remembering his old friend, suggested Johnson to committee members Denny Long of Toledo and James Manning of Kansas City. That November, Ban Johnson was named President-Secretary-Treasurer of the Western League and given a salary of $2,500 a year. In order to boost league attendance, Johnson crusaded against rowdiness in the league, supporting his umpires with better pay and backing up their rulings on the field with stiff penalties for bad behavior. Under Johnson's able stewardship, the league became more profitable over the rest of the 19th century. In 1897 the circuit drew nearly one million fans, with the top clubs in Kansas City, Milwaukee, and St. Paul drawing better than some National League franchises. When the National League voted to scale down from twelve to eight teams prior to the 1900 season, Johnson saw his big opportunity. Shifting the St. Paul club to Chicago and the Columbus franchise to Cleveland, he changed the league's name to the American League. The following year, Johnson declared his organization a major league and abandoned the circuit's western roots, moving franchises into National League territories in Boston and Philadelphia, as well as Baltimore and Washington, cities the National League had abandoned the year before. The newly named American League waived the National League's $2,400 salary cap and enticed 111 players from the National League to jump to the new venture, including top stars Cy Young, Napoleon Lajoie, and John McGraw. Before the 1902 season, Johnson transferred the Milwaukee club to St. Louis to compete head-to-head with the Cardinals, and continued his raid on National League rosters, coming away with more big name players, including sluggers Ed Delahanty, Jesse Burkett, and Elmer Flick. The results were impressive: in 1902 the American League outdrew the National League by more than 500,000 fans. In the four cities home to franchises in both leagues, the upstart American League outdrew the National League in all of them by wide margins. Clearly outmatched, the hapless National League owners finally sued for peace following the 1902 season, and the resulting truce between the two leagues reaffirmed the principle of the reserve clause and the sanctity of contracts. A three-man National Commission was appointed to settle disputes, with Johnson, the National League president, and Cincinnati Reds executive Garry Herrmann, a friend of Johnson's, picked to chair the new governing body. While Herrmann was hardly Johnson's puppet, as he is often portrayed, his close relationship with the American League president did help Johnson to cement his power. 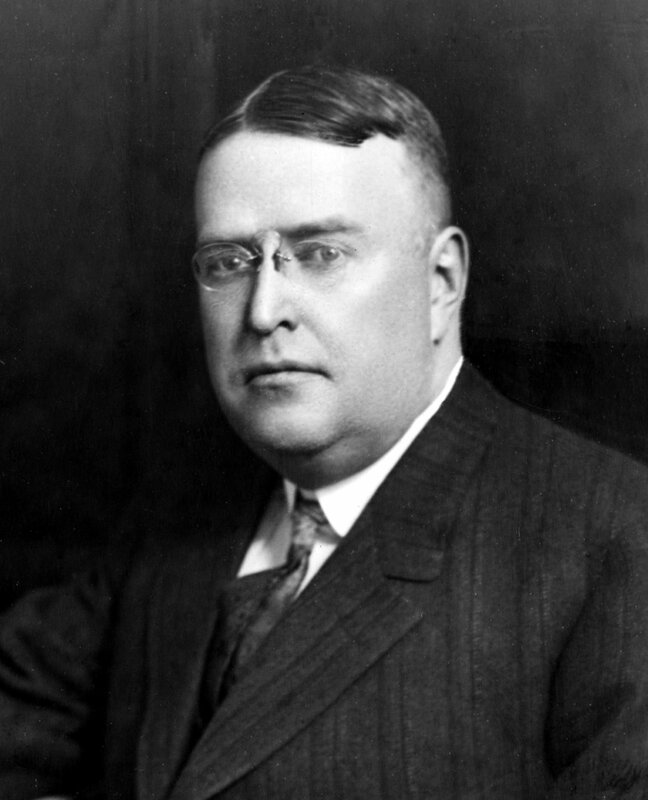 As chief executive of the American League, Johnson extended his efforts to stamp "rowdyism" out of the game. Supporting his umpires with a firm hand, Johnson swiftly punished players and managers who crossed the line. Johnson's tactics were not always successful. When Johnson and Baltimore manager John McGraw clashed over the skipper's unsportsmanlike behavior on the diamond during the 1902 season, McGraw jumped to the New York Giants and took many Orioles with him. Baltimore was able to complete the season only because owners from the other AL teams contributed players from their rosters. After the 1902 season, Johnson moved the Orioles to New York, where they would in time become the most successful franchise in the history of the sport. The American League grew and prospered under Johnson. He dealt with each problem with a firm hand. Whether it was the Tigers striking over Ty Cobb's suspension in 1912 or floating loans to teams to strengthen the league, the obstinate Johnson usually got his way. He became so powerful he even changed the outcome of the 1910 batting race when the results did not suit him. But it was Johnson's arrogant manner and dictatorial inclinations, which eventually led to his downfall. During the last five years of the Deadball Era, four controversial rulings paved the way for the demise of the National Commission and fractured the ownership ranks of the American League into pro-Johnson and anti-Johnson camps. In 1915, the National Commission ruled that George Sisler was the property of the American League's St. Louis Browns. As a 17-year-old, Sisler had signed a contract with the Akron club of the Ohio-Pennsylvania League. Akron was part of the vast farm system of Bobby Quinn and the Columbus Senators of the American Association. Sisler decided instead to attend the University of Michigan. While in college, Sisler's contract was transferred to the parent club and Quinn sold it to the Pittsburgh Pirates. Sisler's coach at Michigan was Branch Rickey. Rickey became the manager of the Browns in 1913, and when Sisler was ready to turn pro, Branch represented the youngster in a legal battle to sign a contract with St. Louis. Rickey's argument was that because Sisler was a minor when he signed the Akron contract, his father's signature was required to make the contract binding. Johnson and Herrmann agreed, and Sisler became a Brown. Barney Dreyfuss, owner of the Pirates, cried foul and vowed to destroy the National Commission. Cubs owner Charles Murphy, disgruntled after a Commission decision, was quoted by I.E. Sanborn in the Sporting News as saying he wanted the entire commission disbanded. His suggestion would later be partially fulfilled. Sanborn claimed that Murphy wanted, ". . . a non partisan, none [sic] baseball body of three or five men, among them an ex judge or two, appointed for life to adjudicate all the disputes now coming before the commission." 4 It was the first nail in the coffin. In 1917, the next nail was driven when Atlanta of the Southern Association sold pitcher Scott Perry's contract to the Braves. Perry jumped the team to play semipro ball. The National Commission ruled that Atlanta could resign Perry for $2,000. The Crackers then sold the journeyman pitcher to the A's. When Boston objected, the National Commission awarded Perry's contract to Philadelphia. Once again, the American League had won a contract dispute, leaving some to wonder if the National League could ever win a case brought before the Commission. Contract dispute number three came before Johnson in 1919, when the American League president awarded pitcher Jack Quinn to the Yankees instead of the Chicago White Sox. Johnson's action effectively ended the life-long friendship with his drinking buddy Comiskey. Gradually over the years, the men who had shared the same Chicago office for nearly two decades became bitter enemies. Later that season, star pitcher Carl Mays of the Boston Red Sox jumped the team and refused to return. The Red Sox traded Mays to the Yankees after Johnson ruled that Mays first had to return to Boston and serve a suspension before he could be traded. The Yankees owners Jacob Ruppert and Tillinghast Huston got a temporary restraining order allowing Mays to pitch for New York. Divided over the issue, the league split into the "Loyal 5" (St. Louis, Philadelphia, Cleveland, Detroit, and Washington) versus the "Insurrectionists" (New York, Boston, and Chicago). The Insurrectionists controlled the five-man Board of Directors and stripped Johnson of much of his power. The owners met, voted in a new board, and reinstated Johnson. The New York owners then bombarded Johnson with lawsuits. Late that year things got so ugly that the Insurrectionists gave the league a one-week ultimatum. If an agreement could not be reached, the Yankees, Red Sox and White Sox would join a 12-team National League. The twelfth team would be the first of the Loyal 5 to jump. If no team moved, the National League planned to place a team in Detroit. Finally, Frank Navin, the Detroit owner, brokered a peace agreement, albeit a tenuous one. Johnson now was required to answer to the owners. A few months later a story broke centering on suspicion that Comiskey's Chicago White Sox had thrown the 1919 World Series to gamblers. Johnson took some pleasure over his former friend's embarrassment. But when he tried to ride in and save the situation, the owners balked. To restore integrity to the game, baseball's magnates decided to replace the National Commission with an all-powerful commissioner. Judge Kenesaw Mountain Landis was chosen for the position. Landis had limited baseball experience, but he was every bit as stubborn as Johnson, who opposed Landis's appointment. Over the next several seasons, Johnson had little interaction with Landis, concerning himself solely with league matters. But in 1927, enraged that his authority had been undermined by Landis in the Ty Cobb-Tris Speaker gambling scandal, Johnson locked horned with the commissioner. In response, the judge gave an ultimatum to the owners, Johnson or Landis. The American League owners voted 7-1 to strip Ban of his powers, but allowed him to retain his title. Phil Ball of the Browns was the lone dissenting vote. After three meetings on July 8, 1927 at the Belmont Hotel in New York, a sick and sullen Johnson passed his scribbled resignation through his hotel door to Ruppert. His resignation would take effect at the end of the season. Ban and his wife of over 30 years, Jane Laymon, retired to Spencer, Indiana. Their marriage had not produced any children. His retirement years were spent fund raising for Marietta College and promoting baseball in Mexico. In his final interview, Johnson stated that major league baseball should extend coast-to-coast. Even near the end of his life, he was still 25 years ahead of his time. Johnson died of diabetes on March 28, 1931 in St. Louis. He was buried in Riverside Cemetery, in Spencer. For this biography, a number of contemporary sources, especially those found in the subject's file at the National Baseball Hall of Fame Library were used. 1 The identity of this observer is unknown. 2 “Mr. Mack” Life Magazine, August 9, 1948, page 95. 5 Branch Rickey with Robert Riger, op. cit.